The Latin text was written around ce 700. The Anglo-Saxon text was added around ce 970. In general, the artisans responsible for an illuminated manuscript are many and not known by name. The Linisfarne Gospels are an exception. An addition was made to the manuscript approximately 100 years after its creation crediting a single individual for the entire manuscript. The creator was a monk known as Eadfrith who was Bishop of Lindisfarne from 698 to 721. The Lindisfarne Gospels have what is commonly referred to as a “carpet page”. Each of the four gospels begins with a portrait of the title character. The page following each of these portraits is a “carpet page”. These pages are completely decorated with an intricate pattern representing the cross. An example is shown below. 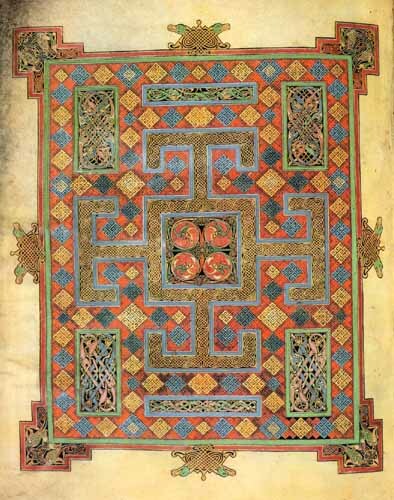 Following the carpet page in each of the Lindisfarne Gospels is an “incipit page”. This is one of the foremost motifs of the European illuminated manuscript. It is the elaborately decorated first letter of the text. An example is shown below. Notice the decorative dots surrounding the letter. 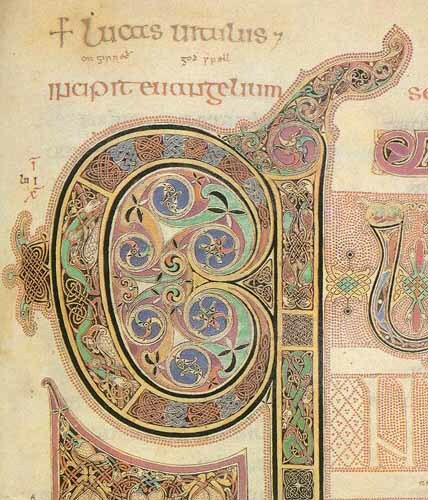 Such decoration is known as “rubrication.” Someone, with a great deal of time on their hands, counted the number of dots on a single page of the Lindisfarne Gospels. The count was 10,600 dots. I’ve put together a small collection of images of the fully decorated pages from the Lindisfarne Gospels in the gallery section of the Medieval Scriptorium.